For the first time in history, Mario and Sonic wind up in a game together that isn't about beating each other up. It isn't the last. Silver, Jet, Cream, Big, Espio, Rouge, Donkey Kong, Birdo, and a Goomba all have data to be playable characters, but are only accessible through hacking. Cream appears in the final version of the game as a referee. 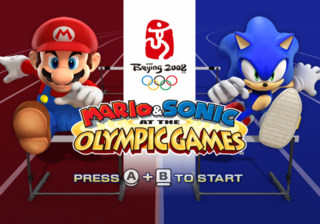 Donkey Kong and Silver are playable in Mario & Sonic at the Olympic Winter Games (in which Goomba gets a cameo) and Mario & Sonic at the London 2012 Olympic Games . Jet, Rouge, Birdo, Cream and Espio only became guest playable characters in Mario & Sonic at the Rio 2016 Olympic Games. Cream and Birdo are exclusive to the 3DS version. The Dream Canoe event from the DS version was originally going to be in the Wii version, but it was scrapped. This music would've played in it. There is an unused song for completing an event in 2nd place. There is also an unused song for 3rd place. The final game replaces both this and the 2nd place theme with the 1st place theme. This song was possibly going to be used in the "Repeat After the Character" mini game. A similar song was used in the DS version for the "Replay" mini game, a game that is very similar to the "Repeat After the Character" mini game. The purpose of this and the next two tracks are unknown. This one sounds as if it would have had something to do with water. The intro of this song suggests that it may have had something to do with space for some reason. This one sounds intense, like it would've been used for a fast-paced game with obstacles. This page was last modified on 16 July 2018, at 05:39.